Insidious: The Last Key (strangely not titled Insidious 4) delves deeper into the origins of the original smash hit from 2010 primarily by recounting the events leading up to it. With Adam Robitel (The Taking of Deborah Logan) at the helm of the latest entry, the Insidious series has now seen three different directors take charge, with each bringing their own strengths and weaknesses to the table. James Wan’s first two films struck an admirable balance between mastering the physical spaces that generate fear in a haunted house, and an increasingly playful disposition. Screenwriter Leigh Whannell proved himself equally capable in the director’s chair for the third film, duly sticking to the attribute that has arguably made the films as successful as they are: the characters. This time around, Robitel injects new life into the seasoned veteran of the series, Elise Rainer, played by the incomparable Lyn Shaye. Following the legendary demon slayer, the film balances past and present as she revisits her still-haunted childhood home. While providing Shaye with the platform she so richly deserves as such an accomplished actress, The Last Key moves the Insidious films into previously unchartered thematic territory, with some typically sturdy scares along the way. The film begins with an insightful prologue: a young Elise and her brother encounter a spectral voice, while their abusive father sleeps in front of the television downstairs. The entity teases and toys with their nerves, until the commotion suddenly irks their restless father. He towers over them in a fury, and elects to lock Elise in the basement with the kind of wretched paternal gusto that implies he has done so many times before. Only this time, in her terrifying isolation, Elise suffers a trauma so profound that it informs every sphere of her character when she later returns to encounter the space once more. The sequence contains some dazzling and bizarre imagery; welcome material for the genre that can sometimes thrive too much on flashing ‘scary’ faces out of nowhere. 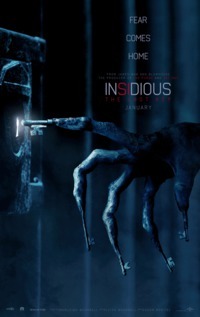 It succeeds as a thematic prologue for the film in its suggestion that abusive humans can often possess more monstrous qualities than the phantom entities lurking beneath a child’s bed. Decades later, Elise, the figurehead of a rather hapless post-2008 ghostbusting business, receives a typical phonecall asking for an exorcism quote. She nods along, scribbling down the details, until her pencil snaps at the realisation that the address is for her childhood home. This is a case she cannot turn down, despite it being the only one that may actually get the better of the steadfast maestro. Try though it may, the perennial entity throws all it can muster at Elise and her hapless sidekicks until she peels back the layers to confront what it really wants. In much the same vain as the fabulous The Conjuring 2 (2016), where simply naming the entity forces it to dissipate, here the titular ‘last key’ that provides resolution to the narrative proves to be elusive, abstract, and yet deceptively simple. We live in an age where demons and ghostly apparitions simply aren’t as frightening as the real physical world, and the most recent Insidious film recognizes this as an inevitability: Elise, who usually confronts the paranormal without a flicker, meets her match in a horror that is palpable and real. It satisfies in enriching the overall narrative of the series, grounding character fears in a timely reality that refuses to let abusers continue to escape accountability. This review was published on July 16, 2018.